A tissue sealant for use in surgical and medical procedures for sealing the tissues of a living mammal is provided. The tissue sealant comprises a hydrogel which is formed by gelation of a premix disposed on the tissue to be sealed. The premix comprises an alkylated chitosan, a polybasic carboxylic acid, a dehydrating reagent, and a carboxyl activating reagent in an aqueous medium. A preferred use of the tissue sealant is in the repair of the dura mater after brain surgery to prevent leakage of cerebrospinal fluid. The tissue sealant may include a therapeutic or protective agent such as an antibiotic or an anti-inflammatory drug. Tissue sealants are increasingly important adjuncts in surgical procedures, being used in fields such as vascular surgery, cardiac surgery, spine surgery and brain surgery as well as in general surgery. Uses for tissue sealants include, among others, augmenting or replacing sutures to join tissues or place them in proximity, closing perforations in biological membranes to prevent leakage of fluids, incorporating medicinal substances at the location of emplacement for localized release, and filling areas of tissue removal. One commonly used tissue sealant is fibrin glue, a material analogous to clotted blood, which is obtained from reaction of fibrinogen and thrombin isolated from blood plasma. For example, see “Fibrin Glue from Stored Human Plasma: An Inexpensive and Efficient Method for Local Blood Bank Preparation,” William D. Spotnitz, M.D., Paul D. Mintz, M.D., Nancy Avery, M. T., Thomas C. Bithell, M.D., Sanjiv Kaul, M.D., Stanton P. Nolan, M.D. (1987), The American Surgeon, 53, 460-62. However, concern about possible viral or prion contamination of human blood-derived protein products, and dissatisfaction with the relatively long times often required for fibrin gelation or “setting” to occur, have resulted in a search for tissue sealants with more advantageous properties. A tissue sealant that does not use proteins isolated from mammalian blood, such as Duraseal® produced by Confluent Surgical Inc. of Waltham, Mass., comprises tri-lysine-amine and an activated polyethyleneglycol. A similar product, termed CoSeal® and produced by Baxter of Deerfield, Ill., is likewise composed of synthetic functionalized polyethyleneglycol derivatives, also avoiding the use of blood-derived materials. However, both of these synthetic hydrogels are dimensionally unstable in the presence of water, undergoing considerable swelling. For example, see “Evaluation of Absorbable Surgical Sealants: In vitro Testing,” Patrick K. Campbell, PhD, Steven L. Bennett, PhD, Art Driscoll, and Amar S. Sawhney, PhD, at www.duralsealant.com/duralsealant/literature.htm. This tendency to swell can be highly disadvantageous in certain applications, such as neurosurgery, where the resulting pressure on nerve or brain tissue can produce serious side-effects. Hydrogels are gels in which water is the dispersion medium. A common example of a hydrogel is a gel formed from the protein gelatin in water. Other hydrogels are formed by polysaccharides such as agar dispersed in water. Hydrogels in the form of sheets are used as wound dressings, where they are favored for their ability to help maintain a moist environment to facilitate healing of the wound without drying and cracking of tissues. For example, see www.medicaledu.com/hydrogellsheet.htm. Chemical derivatives of chitosan have also been used to form hydrogels for use as surgical sealants and in drug delivery devices. U.S. Pat. No. 6,602,952, assigned to Shearwater Corp., describes the preparation of poly(alkyleneoxide)chitosan derivatives and their use in the formation of hydrogels. The addition of these hydrophilic but non-ionic groups to the chitosan molecule alters its physical properties. Poly(alkyleneoxides) such as poly(ethyleneoxide), also known (somewhat inaccurately) as poly-ethyleneglycols or PEGs, are formed by the polymerization of alkylene oxides (epoxides) such as ethylene oxide. They may be obtained in a wide variety of molecular weights, with various structural features such as activated end groups, hydrolysable linkages, and others. For example, see the Nektar PEG catalog that lists a wide variety of the Shearwater functionalized PEGs, at www.nektar.com/pdf/nektar_catalog.pdf. Thus, there is an ongoing need for a hydrogel tissue sealant that is not blood or animal protein derived, that consists of biocompatible materials, is dimensionally stable after emplacement in the patent's body, has good sealant and tissue adhesive properties, is of sufficient strength and elasticity to effectively seal biological tissues, that can be readily prepared and used during surgery, and that forms the tissue seal on a timescale compatible with surgery on living patients. The invention further provides a premix that on standing forms a hydrogel that seals biological tissues, preferably adhering to the tissues. The invention further provides a premix for a hydrogel tissue sealant comprising an alkylated chitosan, a polybasic carboxylic acid, a carboxylic acid activating reagent, a dehydrating reagent, and an aqueous medium. The invention further provides a preferred embodiment of a premix comprising an alkylated chitosan wherein the alkylated chitosan comprises a poly(oxyalkylene)chitosan and the polybasic carboxylic acid comprises a hyaluronan. In another preferred embodiment according to the present invention, the premix comprises an alkylated chitosan wherein the alkylated chitosan comprises an acrylated chitosan and the polybasic carboxylic acid comprises a dibasic carboxylic acid. In another preferred embodiment according to the invention, the carboxyl activating reagent is an N-hydroxy compound that can form an ester with the carboxyl group, preferably N-hydroxysuccinimide (NHS). In yet another preferred embodiment, the dehydrating reagent is a carbodiimide, that removes the elements of water from reactants by thermodynamically driving the reaction through formation of a urea compound. In one embodiment, the preferred carbodiimide is 1-ethyl-3-(N,N-dimethylpropyl)carbodiimide (EDCI). The invention further provides methods for preparing the tissue sealants as are described herein for medical or veterinary use. The tissue sealants comprise a hydrogel that preferably adheres to the biological tissue of a living mammal. A preferred method of preparation of a tissue sealant comprising a hydrogel according to the present invention is through combination of an alkylated chitosan, a polybasic carboxylic acid, a carboxyl activating reagent, a dehydrating reagent, and an aqueous medium. In one preferred embodiment of a method of preparation of a tissue sealant comprising a hydrogel according to the present invention, the alkylated chitosan comprises a poly(oxyalkylene)chitosan. The poly(oxyalkylene)chitosan is preferably poly(oxyethylene)chitosan, also knows as PEG-chitosan, PEG-grafted chitosan, or polyethyleneglycol-chitosan. However, other poly(oxyolkylene)chitosans may be used without departing from the principles of the invention. In a second preferred embodiment of a method of preparation of a tissue sealant comprising a hydrogel according to the present invention, the alkylated chitosan comprises an acrylated chitosan. Preferably, the acrylated chitosan comprises a chitosan that has been N-alkylated with acrylates. Another preferred embodiment of a method of preparation comprises the use of a water-soluble carbodiimide as a dehydrating reagent. Preferably the water-soluble carbodiimide EDCI is used. A further preferred embodiment of a method of preparation comprises the use of a carboxyl activating reagent. The carboxyl activating reagent preferably reacts with a carboxyl group to provide an activated ester or similar material, wherein the carbonyl carbon of the carboxyl group is activated to receive a nucleophilic reactant such as an amino group, resulting in the formation of an amide bond. Preferably, a carboxyl activating reagent comprises a reagent that can form an ester of an N-hydroxy compound in reaction with the carboxyl group. Preferably, the reagent comprises N-hydroxysuccinimide, N(1)-hydroxybenzotriazole, or such. The invention further provides methods for using a hydrogel according to the present invention in tissue repair and other medical procedures. A preferred embodiment of a hydrogel according to the present invention is used to reinforce a suture line, or to seal cut, torn, or perforated tissues. It is also used to prevent leakage of biological fluids, such as cerebrospinal fluid, through repair of biological membranes that when intact contain the fluids. It is used to bring tissues into approximation and hold them in place after a surgical procedure has been carried out. In another preferred embodiment of a use of a hydrogel according to the present invention, the hydrogel may further comprise a protective or therapeutic material or substance. The substance may be an antibiotic, an anticancer agent, a peptide, a protein, a nucleic acid or a nucleic acid analog, a radioactive material, or another protective or therapeutic substance where it is advantageous to provide the substance at the location within the body where the hydrogel is emplaced. For example, the protein may be a growth factor, such as a vascular growth factor or a factor that induces a particular kind of tissue growth, such as bone morphogenic factor. In another preferred embodiment, the protein may be an inhibitory factor, such as a receptor antagonist such as for a growth factor, when supply of an inhibitory factor is desirable, for example after removal of a tumor or cancerous tissue. In yet another preferred embodiment, the nucleic acid may be an antisense nucleic acid, or a small interfering nucleic acid analog, wherein it is advantageous to securely emplace the material at a particular site within a living mammal undergoing treatment for a condition responsive to such therapy. In another preferred embodiment, the therapeutic agent may be an antibiotic to inhibit bacterial infection after repair of a wound or after damage to tissues caused by surgery. Or, a protective agent may be an anti-inflammatory substance wherein it is advantageous to supply the substance directly at the site of damage that is repaired with the tissue sealant, such as to reduce swelling and resulting pressure on surrounding tissues. In another preferred embodiment, the hydrogel comprises a dye, such as a visible dye or a radio-opaque dye, to enable visualization of the position of localization of the hydrogel in the body. In another preferred embodiment, the hydrogel comprises a microsphere or a nanosphere, preferably a large number of microspheres or nanospheres dispersed in the hydrogel. Preferably the microsphere or nanosphere contains a therapeutic agent or a protective agent. As used herein, the term “to seal” or “sealing” refers to the act wherein two physically noncontiguous tissues or portions thereof are joined together, or where a hole, tear, cut, perforation or other discontinuity is repaired so as to close the hole, tear, cut or perforation. Sealing implies at least some degree of adhesion of the material used to the tissue to which it is applied, such that the sealed tissue is secured against at least a moderate displacing force. The discontinuity in the tissue that is being sealed may be an incision made as part of a surgical procedure, or it may be a wound. A “sealant” is a material which is used to seal tissue. As mentioned, a sealant adheres, at least to some degree, to the tissue which is being sealed, such that the sealant material is unlikely in the short term to detach from the repaired or sealed tissue under the influence of at least a moderate force, such as may be experienced when a patient to whom the sealant has been applied moves in a normal fashion. However, the sealant may be biodegradable and eventually dissolve or be absorbed into the patient's body without departing from the principles of the invention. The terms “adhesive” and “adhesivity” similarly refer to the existence of a physical bond between two materials such as a tissue sealant and the tissue to which the sealant is applied. An adhesive is a material which adheres to tissue or other material and which may be used to constrain the separation of two tissue masses. Adhesivity is the property or degree to which a material adheres to a tissue or other material. As used herein, “chitosan” refers to a polysaccharide polymer, either obtained from a natural source such as chitin, or synthetically prepared. Chemically, chitosan is predominantly a polymer of β1,4-linked 2-amino-2-deoxyglucose monomers. When prepared from a natural source, the usual natural source is chitin, a major constituent of the shells of crabs, shrimp and other arthropods. Chitin is chemically a polymer comprising β1,4-linked 2-acetamino-2-deoxyglucose monomers. After isolation of chitin from its natural source, it is treated in a manner as to cause hydrolysis of the acetamido group without cleavage of the sugar-sugar bonds, typically through alkaline hydrolysis. 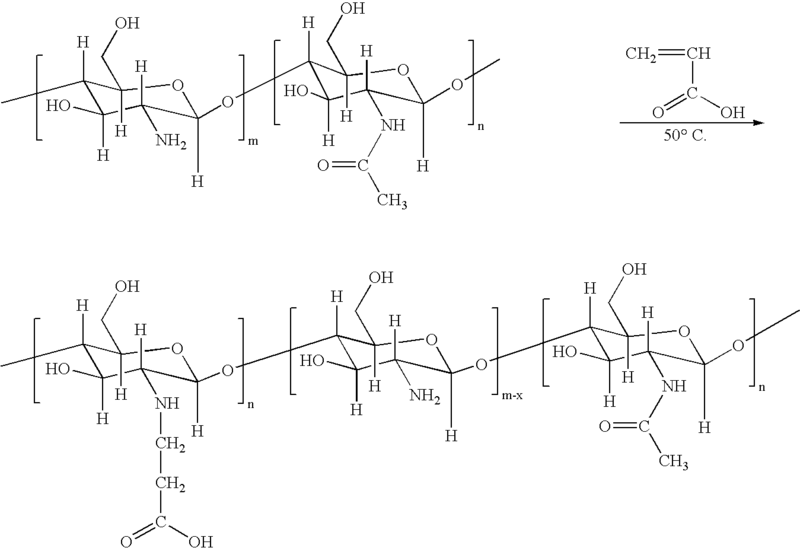 Chitosan is not a single molecular entity, but comprises polymeric chains of various lengths. As used herein, an “alkylated chitosan” is a sample formed of chitosan molecules to which carbon-containing molecules have been bonded. The term “alkylated chitosan” thus comprises an enormous number of possible chemical structures, but they all share the unifying feature that chemical bonds have been formed between the components of the chitosan molecules and at least one carbon atom in each of the molecules that are bonded to the chitosan. For example, methylation of chitosan, in which bonds are formed between methyl radicals or groups and atoms within the chitosan molecule, such as nitrogen, oxygen or carbon atoms, provides an alkylated chitosan within the definition used herein. Other carbon-containing groups may likewise be chemically bonded to chitosan molecules to produce an alkylated chitosan. The end of the poly(oxyethylene) chain that is not bonded to the chitosan backbone may be a free hydroxyl group, or may comprise a capping group such as methyl. Thus, “polyethylene glycol” or “poly(oxyethylene)” or “poly(oxyalkylene)” as used herein includes polymers of this class wherein one, but not both, of the terminal hydroxyl groups is capped, such as with a methyl group. In a preferred method of preparation of the poly(oxyethylene)chitosan, use of a polyethyleneglycol capped at one end, such as MPEG (methyl polyethyleneglycol) may be advantageous in that if the PEG is first oxidized to provide a terminal aldehyde group, which is then used to alkylate the chitosan via a reductive amination method, blocking of one end of the PEG assures that no difunctional PEG that may crosslink two independent chitosan chains is present in the alkylation reaction. It is preferred to avoid crosslinking in preparation of the poly(oxyethylene)chitosan of the present invention. FIG. 1 provides an example of the chemical structure of a segment of a preferred poly(oxyethylene)chitosan polymer. As used herein, a “polybasic carboxylic acid” means a carboxylic acid with more than one ionizable carboxylate residue per molecule. The carboxylic acid may be in an ionized or salt form within the meaning of the term herein. A dibasic carboxylic acid is a polybasic carboxylic acid within the meaning herein. Thus, adipic acid is a polybasic carboxylic acid, having two ionizable carboxylate residues per molecule. Disodium adipate is a polybasic carboxylic acid within the meaning of the term herein. Alternatively, the polybasic carboxylic acid may have hundreds or thousands of ionizable carboxylate groups per molecule; for example, hyaluronan, also known as hyaluronic acid, is a polybasic carboxylic acid within the meaning assigned herein. The hyaluronan or hyaluronic acid may be in an ionized or salt form within the meaning used herein. Thus sodium hyaluronate is a polybasic carboxylic acid within the meaning of the term as used herein. An example of the chemical structure of a segment of a hyaluronan polymer is shown in FIG. 2. A “dehydrating reagent” as used herein refers to a molecular species that takes up the elements of water from a reaction, serving to drive a coupled reaction due to thermodynamic factors. A dehydrating reagent is an compound that undergoes reaction of covalent bonds upon taking up the elements of water, as opposed to merely absorbing water into physical particles or the like. Preferably a dehydrating reagent is an organic compound. A specific example of a dehydrating reagent is a carbodiimide, that takes up the elements of water and undergoes changes in covalent bonds to ultimately yield a urea derivative. As used herein, a “carbodiimide” is a class of organic substances comprising a R—N═C═N—R′ moiety. Any organic radicals may comprise the R and R′ groups. A water-soluble carbodiimide is a carbodiimide that has sufficient solubility in water to form a homogeneous solution at concentrations suitable to carry out the gelation reaction as described herein. The water-soluble diimide EDCI is 1-ethyl-3-N,N-dimethylaminopropylcarbodiimide. The term “N-hydroxy compound” refers to an organic compound comprising a chemical bond between a hydroxyl group and a nitrogen atom. Preferred N-hydroxy compounds such as N-hydroxysuccinimide and N-hydroxybenztriazole (1-hydroxy benzotriazole) are well known in the art as reagents that form esters with carboxylic acid groups and serve to activate the carboxylic acid group in reactions with nucleophiles. A “therapeutic agent” is any agent which serves to repair damage to a living organism to heal the organism, to cure a malcondition, to combat an infection by a microorganism or a virus, to assist the body of the living mammal to return to a healthy state. A “protective agent” is any agent which serves to prevent the occurrence of damage to an organism, such as by preventing the establishment of an infection by a microorganism, to prevent the establishment of a malcondition, to preserve an otherwise healthy body in the state of health. Thus, therapeutic and protective agents comprises pharmaceuticals, radiopharmaceuticals, hormones or their analogs, enzymes, materials for genetic therapy such as antisense nucleotides or their analogs, macroscopic ingredients such as bone powder as is used to induce bone growth, growth factors as may be used to stimulate tissue growth such as by angiogenesis, or any other such agents as are medically advantageous for use to treat a pathological condition. As used herein, “treating” or “treat” includes (i) preventing a pathologic condition from occurring (e.g. prophylaxis); (ii) inhibiting the pathologic condition or arresting its development; (iii) relieving the pathologic condition; and/or (iv) diminishing symptoms associated with the pathologic condition. A “gene therapy agent” refers to an agent that causes expression of a gene product in a target cell through introduction of a gene into the target cell followed by expression. An example of such a gene therapy agent would be a genetic construct that causes expression of a protein, such as insulin, when introduced into a cell. Alternatively, a gene therapy agent can decrease expression of a gene in a target cell. An example of such a gene therapy agent would be the introduction of a polynucleic acid segment into a cell that would integrate into a target gene and disrupt expression of the gene. Examples of such agents include viruses and polynucleotides that are able to disrupt a gene through homologous recombination. Methods of introducing and disrupting genes with cells are well known to those of skill in the art. As used herein, a “peptide” and a “protein” refer to polypeptides, linear polymers of amino acids, the difference between the terms “peptide” and “protein” largely being in the length of the polymer. In one embodiment, the polypeptide can be an antibody. Examples of such antibodies include single-chain antibodies, chimeric antibodies, monoclonal antibodies, polyclonal antibodies, antibody fragments, Fab fragments, IgA, IgG, IgM, IgD, IgE and humanized antibodies. In one embodiment, the antibody can bind to a cell adhesion molecule, such as a cadherin, integrin or selectin. In another embodiment, the antibody can bind to an extracellular matrix molecule, such as collagen, elastin, fibronectin or laminin. In still another embodiment, the antibody can bind to a receptor, such as an adrenergic receptor, B-cell receptor, complement receptor, cholinergic receptor, estrogen receptor, insulin receptor, low-density lipoprotein receptor, growth factor receptor or T-cell receptor. Antibodies of the invention can also bind to platelet aggregation factors (e.g., fibrinogen), cell proliferation factors (e.g., growth factors and cytokines), and blood clotting factors (e.g., fibrinogen). In another embodiment, an antibody can be conjugated to an active agent, such as a toxin. In the claims provided herein, the steps specified to be taken in a claimed method or process may be carried out in any order without departing from the principles of the invention, except when a temporal or operational sequence is explicitly defined by claim language. Recitation in a claim to the effect that first a step is performed then several other steps are performed shall be taken to mean that the first step is performed before any of the other steps, but the other steps may be performed in any sequence unless a sequence is further specified within the other steps. For example, claim elements that recite “first A then B, C, and D, and lastly E” shall be construed to mean step A must be first, step E must be last, but steps B, C, and D may be carried out in any sequence between steps A and E and the process of that sequence will still fall within the four corners of the claim. Similarly, except as explicitly required by claim language, a single substance or component may meet more than a single functional requirement, provided that the single substance fulfills more than one functional requirement as specified by claim language. A hydrogel for use as a tissue sealant according to the present invention is a hydrogel that achieves a gelled state after formation of a premix from more than a single component. The hydrogel, which may be used to seal the tissues of a living mammal such as a human patient, is formed upon gelation of the premix which is in the physical form of a sol. Mixing of the components that make up the premix provides a liquid or semi-liquid sol that may be pumped or transferred by any technique suitable for handling somewhat viscous liquid materials, such as syringes, pipettes, tubing and the like. Upon standing, the premix sol after a period of time sets up into the hydrogel of the present invention. The premix sol and the resulting hydrogel that forms from the sol are suitable for contact with living biological tissue, being biocompatible and biodegradable. Thus, the hydrogel can remain in contact with living biological tissue within a human patient for an extended period of time without damaging the tissue on which it is disposed. In one preferred embodiment, the hydrogel has adhesive properties towards living tissues on which it is disposed. In another preferred embodiment, the hydrogel contains therapeutic or protective agents that are released into the surrounding tissues on which the hydrogel is disposed. In another preferred embodiment, the hydrogel has both adhesive properties towards the tissue on which it is disposed and also contains therapeutic or protective agents that are released into the surrounding tissues on which the hydrogel is disposed. In another preferred embodiment the hydrogel contains microspheres or nanospheres containing therapeutic agents or protective agents that further control the release of the agents from the hydrogel. A preferred embodiment of a premix that forms a hydrogel according to the present invention comprises an alkylated chitosan. Referring to FIG. 1, in a preferred embodiment an alkylated chitosan comprises a poly(oxyethylene)chitosan. The poly(oxyethylene)chitosan is a polymer formed of 2-amino-2-deoxyglucose monomeric units. Each monomeric unit comprises a single free amino group and two free hydroxyl groups. In FIG. 1, one amino group is alkylated on the nitrogen atom with a poly(oxyethylene) chain, also known as a polyethyleneglycol chain. In the example provided in FIG. 1, the chitosan has a degree of substitution of 0.5, because two of the four amino groups in the tetrameric unit shown bears the substituent. However, a poly(oxyethylene)chitosan according to the present invention may have a degree of amino group substitution ranging down to about 0.1 (wherein only one in about every ten monomeric units is alkylated). Furthermore, a poly(oxyethylene)chitosan according to the present invention may also bear the poly(oxyethylene) derivative on one of the two free hydroxyl groups in a given monomeric unit, or may comprises a mixture of N- and O-alkylated chitosan monomeric units, or be di-alkylated or tri-alkylated on a single monomer unit. Thus, a fully alkylated chitosan monomeric unit has a degree of substitution of 3.0, and a poly(oxyethylene)chitosan according to the present invention may have a degree of substitution ranging up to 3.0 without departing from the principles of the invention. In a preferred embodiment, a premix for a hydrogel contains a polybasic carboxylic acid comprising a hyaluronan. A member of the class of acidic polysaccharides, a hyaluronan bears an ionizable carboxylic acid group on every other monosaccharide residue. Preferably the hyaluronan is in the form of a hyaluronate, that is, with at least most of the carboxylic acid groups being in the ionized or salt form. Sodium hyaluronate is a specific example. Referring to FIG. 2, a hyaluronan or a hyaluronic acid is a polybasic carboxylic acid, and the number of ionizable carboxylate groups per hyaluronan molecule is dependent on the degree of polymerization of the hyaluronan. The degree of substitution of carboxylic acid groups on the polymer backbone, assuming a monomeric unit comprising the disaccharide formed of one glucuronic acid monosaccharide and one 2-acetamido-2-deoxyglucose monosaccharide, is 1.0. Every monomeric unit (disaccharide unit) bears a single ionizable carboxylic acid group. A hyaluronan may be of any of a wide range of degrees of polymerization (molecular weights), but a preferred hyaluronan has a molecular weight of about 2,000 kD to about 3,000 kD. Preferably, a premix that includes a poly(oxyalkylene)chitosan also contains a hyaluronan. In a preferred embodiment, the premix comprises a poly(oxyethylene)chitosan, a hyaluronan, a dehydrating reagent, and a carboxyl activating reagent. Another preferred embodiment of a premix that forms a hydrogel according to the present invention comprises an acrylated chitosan. Referring to FIG. 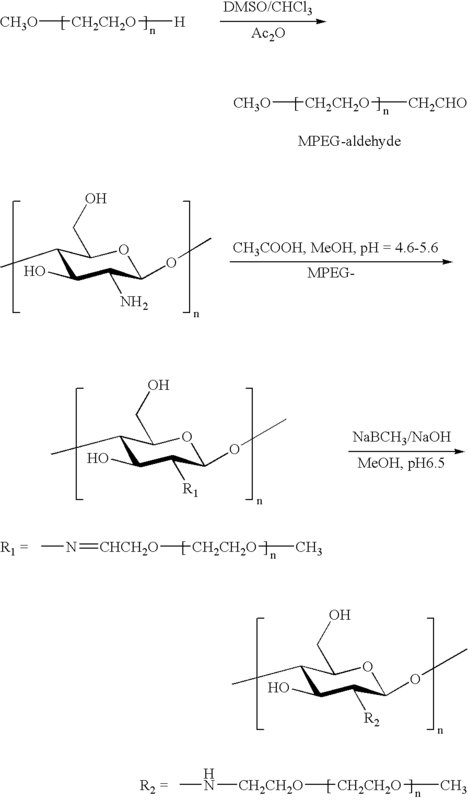 4, in a preferred embodiment an alkylated chitosan comprises a acrylated chitosan wherein at least some of the free amino groups of the 2-amino-2-deoxyglycose monosaccharide monomeric units are substituted with acrylate groups. It is believed that acrylate groups are bonded to free amino groups of the chitosan via a Michael type conjugate addition wherein the nucleophilic amino group forms a bond to the β-carbon of the α,β-unsaturated acrylate, but the acrylate may be bonded to the chitosan in a different manner without departing from the principles of the invention. Furthermore, as is illustrated in FIG. 4, acrylates may themselves oligomerize after initial alkylation of the chitosan backbone. The three-carbon carboxylic acid substituent on the left illustrates the alkylation of chitosan with a single molecule of acrylate, whereas the six-carbon dicarboxylic acid substituent on the right illustrates the product resulting from addition of a second acrylate molecule to the first acrylate molecule, either prior to or subsequent to addition of the first acrylate molecule to the chitosan backbone. Preferably, a premix that includes an acrylated chitosan also includes a polybasic carboxylic acid comprising a dicarboxylic acid. A preferred dicarboxylic acid is a dicarboxylic acid wherein the two carboxylate groups are bonded to a moiety of about one to about twelve carbon atoms, which may comprise chains, aliphatic or aromatic rings, or heteroatoms such as nitrogen, oxygen or sulfur. Referring to FIG. 5, a particularly preferred dicarboxylic acid is a linear alkyl dicarboxylic acid, which crosslinks acrylated chitosan polymer chains through the intermolecular formation of amide bonds between the chitosan amino groups and the carboxylic acid groups of the dicarboxylic acid. Specific examples of dicarboxylic acids are malonic, succinic, glutaric, adipic, pimelic, suberic, azaleic, and sebacic acid. A particularly preferred example is adipic acid. Thus, a preferred premix according to the present invention comprises an acrylated chitosan, adipic acid, a dehydrating reagent, and a carboxyl activating reagent in an aqueous medium. In another preferred embodiment, a premix that includes an alkylated chitosan also includes a polybasic carboxylic acid comprising a carboxymethylcellulose. A carboxymethylcellulose is a derivative of cellulose (a β-1,4 linked polymer of glucose) wherein hydroxyl groups are substituted with carboxymethyl (—CH2CO2H) moieties. It is understood that the term carboxymethylcellulose comprises salts of carboxymethylcellulose, such as the sodium salt. A specific example of a premix comprises acrylated chitosan, carboxymethylcellulose sodium salt, a dehydrating reagent and a carboxyl activating reagent. Carboxymethylcellulose, as is well-known in the art, may have varying degrees of substitution, a “degree of substitution” referring to the number of derivatizing groups, herein carboxymethyl, per each monomer unit on the average. A particularly preferred carboxymethylcellulose according to the present invention has a degree of substitution of about 0.7 and a molecular weight of about 80 kD. A premix according to the present invention comprises a dehydrating reagent. A preferred dehydrating reagent is a dehydrating reagent that is sufficiently stable when dissolved or dispersed in an aqueous medium to assist in driving the formation of the amide bonds before it is hydrolyzed by the water in the aqueous medium. A particularly preferred type of dehydrating reagent is a carbodiimide, which is transformed to a urea compound through incorporation of the elements of water. A water-soluble carbodiimide, such as 1-ethyl-3-(N,N-dimethylpropyl)carbodiimide (EDCI), is particularly preferred as it is soluble in the aqueous medium and thus does not require a co-solvent or dispersant to distribute it homogeneously throughout the premix. Other water-soluble carbodiimides are also preferred dehydrating reagents. A premix according to the present invention comprises a carboxyl activating reagent. A preferred carboxyl activating reagent is a reagent that serves to activate a carboxyl group towards formation of a new bond, such as an amide or ester bond with an amine or a hydroxyl-bearing compound respectively. A preferred embodiment of a carboxyl activating reagent reacts with the carboxyl group to form a new compound as an intermediate, which then further reacts with another substance such as an amine to form an amide, or a hydroxyl-bearing compound to form an ester. A preferred carboxyl activating reagent is an N-hydroxy compound. An N-hydroxy compound reacts with a carboxyl group to form an N-hydroxy ester of the carboxylic acid, which may subsequently react with, for example, an amino group to form an amide. A preferred N-hydroxy compound is N-hydroxysuccinimide. Another preferred N-hydroxy compound is N(1)-hydroxybenzotriazole. In a preferred embodiment of the present invention, a carbodiimide may serve both as a dehydrating reagent and as a carboxyl activating reagent. Thus, a premix comprising an alkylated chitosan, a polybasic carboxylic acid, and a carbodiimide is a preferred embodiment according to the present invention. Another preferred embodiment is a premix comprising an alkylated chitosan, a polybasic carboxylic acid, a carbodiimide, and another molecular species wherein that species is a carboxyl activating reagent. Another preferred embodiment is a premix comprising an alkylated chitosan, a polybasic carboxylic acid, a carbodiimide, and another molecular species wherein that species is a dehydrating reagent. A preferred hydrogel is a hydrogel that adheres to living tissues on which it is disposed such that it may be used as a tissue sealant. A preferred tissue sealant comprising a hydrogel formed by gelation of a premix comprises a hydrogel that has sufficient adhesivity such that after gelation, the gel resists detachment from the tissue when subjected to a force such as may be applied when a patient moves, or by the weight of an organ acted on by gravity, or by involuntary motions of surrounding tissues (heartbeat, peristalsis, etc.). Preferably the degree of adherence is such that under extreme force, the sealant will separate from the tissue to which it adheres before the tissue itself ruptures. A preferred tissue sealant comprising a hydrogel according to the present invention comprises a hydrogel of sufficient strength and elasticity such that the physical integrity of the mass of sealant as it is disposed on the tissue is maintained while the hydrogel adheres to the tissue. The preferred tissue sealant thus is suitable for at least temporarily sealing or repairing a tear, hole, perforation, incision or any separation of tissue where it is medically desired to both hold the tissues around the disrupted area in physical proximity. A preferred tissue sealant of the invention also preferably seals the tear, hole, perforation or incision in order to prevent leakage of any vital bodily fluids that are normally retained by the tissue in its undamaged state. For example, the outer membrane surrounding the brain and the spinal cord, the dura mater, serves to contain the cerebrospinal fluid in which the nervous system tissue is normally immersed. A preferred use for the tissue sealant according to the present invention is the repair or sealing of the dura, such as after brain surgery. To surgically reach the brain in order to carry out any of the operative procedures that may be applied within the brain to treat or cure a malcondition, an incision must be made in the dura, and when the surgical procedures within the brain are complete, it is desirable to close the dura as tightly as possible to avoid leakage of cerebrospinal fluid to areas external to the dura as well as to allow healing of the tissue. A preferred tissue sealant of the present invention is well suited to provide this closure and sealing, either as a reinforcement of a suture line or without additional closure techniques being used. In this preferred use of a tissue sealant of the invention, the premix is prepared and is applied to the incision in the sol form. For aid to the surgeon in visualizing the application of the tissue sealant, the sealant may comprise a dye or a fluorescent material to better enable the surgeon to see and thus control the distribution of the sealant on the tissue being repaired. The sealant may also comprise a radio-opaque agent to aid in visualization of the disposition of the sealant post-operatively. A preferred technique for preparing the premix is with the use of two syringes coupled with a Luer coupling fitting. The fitting optionally contains a three-way T-valve. One syringe is partially filled with a solution comprising an alkylated chitosan dissolved in an aqueous medium. A second syringe is partially filled with a solution comprising a polybasic carboxylic acid dissolved in an aqueous medium. Optionally, either solution may contain additional components such as a co-solvent, dispersant, emulsifier or other additive to assist in dissolving or dispersing the polymeric component. Optionally, either syringe may further contain a dehydrating reagent, a carboxyl activating reagent or both. The hydrogel of the present invention may further comprise a therapeutic agent or a protective agent. Likewise, a tissue sealant of the present invention may comprise the hydrogel with a therapeutic agent or a protective agent. A drug is a preferred embodiment of a therapeutic agent or a protective agent. Thus, the hydrogel of the present invention may contain the therapeutic or protective agent either in use as a tissue sealant, or not in such a use. For example, a hydrogel containing a therapeutic agent may have an insufficient degree of adhesivity to tissue for use as a tissue sealant, but still contain a therapeutic agent and be suitable for placement within a living mammalian body, without departing from the principles of the invention. Such a hydrogel with a therapeutic agent may, for example, be supplied by injection of a premix comprising the therapeutic agent to a site within the body wherein a controlled release of the therapeutic agent is desired but where there is no need for a strongly adhesive sealant to be disposed. Alternatively, the hydrogel may be of sufficient adhesivity for use as a tissue sealant and also contain a drug, such as an antibiotic or an anti-inflammatory agent, such as may be advantageous to provide in close proximity to the disrupted tissue that is sealed by the tissue sealant. A hydrogel may further comprise microspheres or nanospheres which preferably contain a therapeutic agent, the microspheres or nanospheres also controlling the release of the therapeutic agent into the surrounding tissues. A “microsphere” or a “nanosphere” as used herein is a particulate body of dimensions of the order of microns (micrometers) or nanometers respectively, wherein the particulate body may be hollow or solid. Microspheres and nanospheres may be formed of organic or inorganic materials. For example, a nanosphere may comprise a buckminsterfullerene (buckball), which is organic. Alternatively a nanosphere may comprise microporous glass, which is inorganic. It is understood that the terms encompass solid lipid nanoparticles, wherein the nanosphere particles are formed from a solid lipid. Preferably the microsphere or the nanosphere contains a drug or other substance, the timing of the release of which it is advantageous to control. In a preferred embodiment, a tissue sealant comprises a hydrogel including a therapeutic agent or a protective agent. The tissue sealant does have sufficient adhesivity to the tissue on which it is disposed to seal the tissue, and also serves to release the therapeutic agent or the protective agent into the tissues in the vicinity of the tissue on which it is disposed and to which it adheres. Whether or not the hydrogel comprising the agent has sufficient adhesivity to seal the tissue on which it is disposed, the hydrogel may comprise an agent such as an antimicrobial agent; a peptide or a protein such as a growth factor or a bone morphogenic protein; a bone powder or bone substituent to promote bone growth; a nucleic acid or nucleic acid analog such as an anti-sense agent, a small interfering nucleic acid or nucleic acid analog, or a recombinant plasmid; an anti-inflammatory agent, an anti-cancer agent, or a radioactive material. The therapeutic agent or the protective agent may optionally be contained within microspheres or nanospheres. Alternatively, the agent may be a constituent of a polymeric composition that may be dispersed within the premix, such as a controlled release polymer in the form of a finely dispersed powder or the like. Thus the hydrogel may control the release of the agent in conjunction with another structure or material contained within the hydrogel, provided that the structure or material is suitable for dispersion in the premix. 5.52 ml of acrylic acid was dissolved in 150 ml of double distilled water and 3 g of chitosan (Kraeber® 9012-76-4, molecular weight 200-600 kD) was added to it. The mixture was heated to 5° C. and vigorously stirred for 3 days. After removal of insoluble fragments by centrifugation, the product was collected and its pH was adjusted to 11 by adding NaOH solution. The mixture was dialyzed extensively to remove impurities. A premix formed as in Example 3 was disposed on the muscle tissue of a dead mouse. A hydrogel was completely formed after about 10 minutes. A moderate amount of force applied with a pair of forceps did not either detach the hydrogel from the muscle, or rupture the hydrogel. A high degree of hydrogel elasticity was observed. A wound completely penetrating the thickness of the dermal layer of a living mouse was provided. A premix prepared as in Example 3 was disposed in the wound. After one week, the hydrogel was observed to be in place and detachment had not occurred. Evidence of healing along the original wound bed was observed. A premix formed as in Example 3 was applied to a sample of canine dura mater bathed in saline at 37° C. The sealant formed a hard and durable substance within about 90 to 120 seconds of injection. The sample of dura mater was picked up with forceps and gentle pressure was applied to the edges. There was no tearing of the tissue seam. 2. A tissue sealant comprising the hydrogel of claim 1 wherein the hydrogel is capable of adhering to the biological tissue of a living mammal. 3. The hydrogel of claim 1 wherein the alkylated chitosan comprises poly(oxyalkylene)chitosan. 4. The hydrogel of claim 3 wherein the poly(oxyalkylene)chitosan comprises poly(oxyethylene)chitosan. 5. The hydrogel of claim 1 wherein the alkylated chitosan comprises acrylated chitosan. 6. The hydrogel of claim 5 wherein the acrylated chitosan comprises chitosan N-alkylated with acrylates. 7. The hydrogel of claim 1 wherein the polybasic carboxylic acid comprises an acidic polysaccharide. 8. The hydrogel of claim 1 wherein polybasic carboxylic acid comprises a hyaluronan. 9. The hydrogel of claim 1 wherein polybasic carboxylic acid comprises a carboxymethylcellulose. 10. The hydrogel of claim 1 wherein the polybasic carboxylic acid comprises an dibasic carboxylic acid. 11. The hydrogel of claim 10 wherein the dibasic carboxylic acid comprises a dicarboxylic acid wherein the two carboxylic acid groups are independently bonded to a moiety comprising about 1 to about 12 carbon atoms optionally further comprising N, O, or S; the moiety optionally comprising alkyl, cycloalkyl, aryl or alkaryl groups. 12. The hydrogel of claim 11 wherein the dicarboxylic acid comprises malonic, succinic, glutaric, adipic, pimelic, suberic, azaleic, or sebacic acid, or a combination thereof. 13. The hydrogel of claim 1 wherein the carboxyl activating reagent comprises an N-hydroxy compound. 14. The hydrogel of claim 13 wherein the N-hydroxy compound comprises N-hydroxysuccinimide or 1-hydroxybenztriazole. 15. The hydrogel of claim 1 wherein the dehydrating reagent comprises a carbodiimide. 16. The hydrogel of claim 15 wherein the carbodiimide comprises EDCI. 17. The hydrogel of claim 1 wherein the premix is held during gelation at a temperature approximately equal to a mammalian body temperature of about 37° C.
18. The hydrogel of claim 1 wherein the premix is held during gelation for a period of time of about one to about twelve minutes. 19. The tissue sealant of claim 2 wherein the living mammal is a living human being. 20. The hydrogel of claim 1 further comprising a dye material or a radio-opaque material. 21. The hydrogel of claim 1 further comprising a therapeutic or protective agent. 22. The hydrogel of claim 21 wherein the therapeutic or protective agent comprises an antimicrobial agent. 23. The hydrogel of claim 21 wherein the therapeutic or protective agent comprises a peptide or a protein. 24. The hydrogel of claim 23 wherein the peptide or protein comprises a growth factor. 25. The hydrogel of claim 23 wherein the peptide or protein comprises a bone morphogenic factor. 26. The hydrogel of claim 21 wherein the therapeutic or protective agent comprises a bone powder or a bone substitute. 27. The hydrogel of claim 21 wherein the therapeutic or protective agent comprises a nucleic acid or nucleic acid analog. 28. The hydrogel of claim 27 wherein the nucleic acid or nucleic acid analog comprises an antisense nucleic acid or nucleic acid analog, or a small interfering nucleic acid or nucleic acid analog, or a recombinant plasmid. 29. The hydrogel of claim 21 further comprising an anti-inflammatory agent. 30. The hydrogel of claim 21 wherein the therapeutic or protective agent comprises an anti-cancer agent. 31. The hydrogel of claim 21 wherein the therapeutic or protective agent comprises a radioactive material. 32. A hydrogel comprising an alkylated chitosan having amino groups and a polybasic carboxylic acid having carboxylic acid groups, at least some of the amino groups and at least some of the carboxylic acid groups being joined together by amide bonds, the amide bonds being formed by the action of a carboxyl activating reagent or a dehydrating reagent in an aqueous medium. 33. A tissue sealant comprising the hydrogel of claim 32 wherein the hydrogel adheres to a living biological tissue. 34. The hydrogel of claim 32 wherein the alkylated chitosan comprises poly(oxyalkylene)chitosan. 35. The hydrogel of claim 32 wherein the alkylated chitosan comprises acrylated chitosan. 36. The hydrogel of claim 32 wherein the polybasic carboxylic acid comprises an acidic polysaccharide. 37. The hydrogel of claim 32 wherein the polybasic carboxylic acid comprises a hyaluronan or a carboxymethylcellulose. 38. The hydrogel of claim 32 wherein the polybasic carboxylic acid comprises a alkane α,ω-dicarboxylic acid. 39. The hydrogel of claim 32 wherein the carboxyl activating reagent is an N-hydroxy compound. 40. The hydrogel of claim 32 wherein the dehydrating reagent is a carbodiimide. allowing the premix to form the hydrogel by gelation such that the hydrogel formed by gelation is disposed on the biological tissue. 42. A method of preparing a tissue sealant for sealing the biological tissue of the living mammal, comprising the method of claim 41 wherein the hydrogel formed by gelation from the premix is capable of adhering to the biological tissue on which it is disposed, to seal the biological tissue. 43. The method of claim 41 wherein the step of combining with mixing further comprises a step of combining with mixing using two mutually coupled syringes. 44. The method of claim 41 wherein the step of allowing the premix to form a hydrogel by gelation further comprises warming the premix to about the body temperature of a living mammal. 45. The method of claim 41 wherein the alkylated chitosan comprises a poly(oxyalkylene)chitosan. 46. The method of claim 45 wherein the poly(oxyalkylene)chitosan comprises poly(oxyethylene)chitosan. 47. The method of claim 41 wherein the chitosan derivative comprises an acrylated chitosan. 48. The method of claim 41 wherein the acrylated chitosan comprises chitosan N-alkylated with acrylates. 49. The method of claim 41 wherein the polybasic carboxylic acid comprises an acidic polysaccharide. 50. The method of claim 49 wherein the acidic polysaccharide comprises a hyaluronan or a carboxymethylcellulose. 51. The method of claim 41 wherein the polybasic carboxylic acid comprises a dicarboxylic acid wherein the two carboxylic acid groups are independently bonded to a moiety comprising about 1 to about 12 carbon atoms optionally further comprising N, O, or S; the moiety optionally comprising alkyl, cycloalkyl, aryl or alkaryl groups. 52. The method of claim 41 wherein the carboxyl activating reagent comprises an N-hydroxy compound. 53. The method of claim 52 wherein the N-hydroxy compound is N-hydroxysuccinimide or 1-hydroxybenzotriazole. 54. The method of claim 41 wherein the dehydrating reagent is a carbodiimide. 55. The method of claim 54 wherein the carbodiimide is EDCI. 56. The method of claim 41 wherein the step of combining with mixing an alkylated chitosan and an aqueous medium further comprises dissolving the alkylated chitosan in the aqueous medium at a concentration of about 1% to about 10% by weight. 57. The method of claim 56 wherein the alkylated chitosan concentration is about 3% to about 7% by weight. 58. The method of claim 57 wherein the alkylated chitosan concentration is about 5% by weight. 59. The method of claim 41 wherein the step of combining with mixing a polybasic carboxylic acid and an aqueous medium further comprises dissolving the polybasic carboxylic acid in the aqueous medium at a concentration of about 0.1% to about 5% by weight. 60. The method of claim 59 wherein the polybasic carboxylic acid concentration is about 0.3% to about 0.7% by weight. 61. The method of claim 60 wherein the polybasic carboxylic acid concentration is about 0.5% by weight. 62. The method of claim 41 wherein a concentration of the dehydrating reagent in the aqueous medium is about 5 mg/mL to about 10 mg/mL. 63. The method of claim 62 wherein the dehydrating reagent concentration is about 7 mg/mL. 64. The method of claim 41 wherein a concentration of the carboxyl activating reagent in the aqueous medium is about 1 to about 5 mg/mL. 65. The method of claim 64 wherein the carboxyl activating reagent concentration in the premix is about 2.5 mg/mL. 66. The method of claim 41 wherein the premix comprises a dye material or a radio-opaque substance. 67. The method of claim 41 wherein the premix comprises a therapeutic or protective agent. 68. The method of claim 42 wherein the tissue sealant comprises a therapeutic or protective agent. 69. The method of claim 67 wherein the therapeutic or protective agent comprises an antimicrobial agent. 70. The method of claim 67 wherein the therapeutic or protective agent comprises a peptide or a protein. 71. The method of claim 70 wherein the peptide or protein comprises a growth factor or a bone morphogenic factor. 72. The method of claim 67 wherein the therapeutic or protective agent comprises a bone powder or a bone substitute. 73. The method of claim 67 wherein the therapeutic or protective agent comprises a nucleic acid or nucleic acid analog. 74. The method of claim 73 wherein the nucleic acid or nucleic acid analog comprises an antisense nucleic acid or nucleic acid analog, or a small interfering nucleic acid or nucleic acid analog. 75. The method of claim 73 wherein the nucleic acid or nucleic acid analog comprises a recombinant plasmid. 76. The method of claim 73 wherein the nucleic acid or nucleic acid analog comprises an artificial gene. 77. The method of claim 67 wherein the therapeutic or protective agent comprises an anti-cancer agent. 78. The method of claim 67 wherein the therapeutic or protective agent comprises a radioactive material. 79. The method of claim 78 wherein the radioactive material comprises a radioactive isotope for anti-cancer therapy. 80. The method of claim 67 wherein the therapeutic or protective agent comprises a substance for gene therapy. 81. Use of the tissue sealant of claim 2 or of claim 33, or of the tissue sealant prepared according to the method of claim 42, comprising adhesively sealing a disrupted biological tissue in need thereof in a living mammal. 82. The use of claim 81 wherein the mammal is Homo sapiens. 83. The use of claim 81 wherein the biological tissue is disrupted by an injury. 84. The use of claim 81 wherein the biological tissue is disrupted by a surgical procedure. 85. The use of claim 81 wherein the biological tissue comprises a meninx of a nervous system organ. 86. The use of claim 85 wherein the meninx comprises dura mater. 87. The use of claim 85 wherein the nervous system organ comprises brain or spinal cord. 88. The use of claim 81 wherein the biological tissue comprises blood vessels. 89. The use of claim 81 wherein the biological tissue comprises musculature. 90. The use of claim 81 wherein the biological tissue comprises neural tissue. 91. The use of claim 81 wherein the biological tissue comprises the annulus of an intervertebral disk. 92. The use of claim 81 wherein the biological tissue comprises cartilage. 93. The use of claim 81 wherein the biological tissue comprises bone. 94. The use of claim 81 wherein the biological tissue comprises dermal tissue. 95. The use of claim 81 comprising adhesively sealing the disrupted biological tissue against leakage of a biological fluid. 96. The use of claim 95 wherein the biological fluid is cerebrospinal fluid. 97. The use of claim 81 comprising reinforcement of a sutured biological tissue. 98. The use of claim 81 comprising holding portions of disrupted biological tissue in mutual proximity. 99. The use of claim 81 comprising filling in a void resulting from tissue removal. 100. The use of claim 81 further comprising application of a therapeutic or a protective agent contained within the tissue sealant. 101. The use of claim 100 wherein the therapeutic or protective agent comprises an antimicrobial agent. 102. The use of claim 100 wherein the therapeutic or protective agent comprises a peptide or a protein. 103. The use of claim 102 wherein the peptide or protein comprises a growth factor or a bone morphogenic factor. 104. The use of claim 100 wherein the therapeutic or protective agent comprises a bone powder or a bone substitute. 105. The use of claim 100 wherein the therapeutic or protective agent comprises a nucleic acid or nucleic acid analog. 106. The use of claim 105 wherein the nucleic acid or nucleic acid analog comprises an anti-sense nucleic acid or nucleic acid analog, or a small interfering nucleic acid or nucleic acid analog. 107. The use of claim 105 wherein the nucleic acid or nucleic acid analog comprises a recombinant plasmid or an artificial gene or a substance for gene therapy. 108. The use of claim 100 wherein the therapeutic or protective agent comprises an anti-cancer agent. 109. The use of claim 100 wherein the therapeutic or protective agent comprises a radioactive material. 110. The use of claim 109 wherein the radioactive material comprises a radioactive isotope for anti-cancer therapy. 111. The use of claim 100 wherein the therapeutic or protective agent is further contained within a microsphere or a nanosphere.